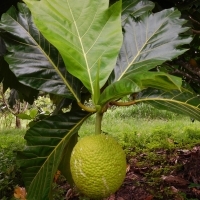 The breadfruit tree or Ulu loves a hot climate and treasured by many islanders because of it's high yields, Some islanders have been known to survive purely by eating the bounty of the breadfruit tree no wonder they have legends about it. The English heard of it's reputation and endeavoured to transport it to the Caribian. When water supplies went low the famous captain Bligh would take water away from his crew to ensure the survival of his breadfruit trees but the thirsty crew threw the breadfruit trees overboard along with Captain Bligh. Amazingly he survived. Trial Product, Daley's is currently trialling this product, but we will not have them available for sale in the foreseeable future. If you are interested in this item please request the email notification from this page, but at this stage we cannot give you an estimated time of availability. 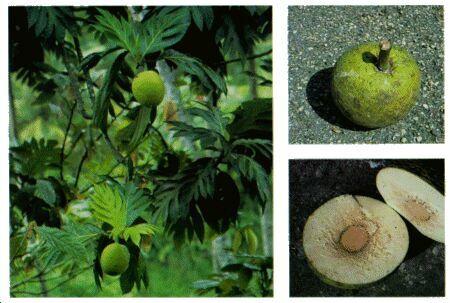 Origins in SE Asia but now widespread across the Pacific Islands as a staple food. The flesh of this large green fruit is used in the same way as potato. Stores well when dried or frozen. The tree reaches 20m, requiring hot tropical areas. Not suitable for temperate climates.